For all of you coffee or tea lovers out there, today’s tutorial is for you! Personally, I think there’s nothing better than a hot, steaming mug of delicious tea with a bit of milk and a spoonful of sugar in it. That was, until I discovered scented hot pad coasters! Not only do they protect your tables from your drink, but the heat of the mug warms up the coaster and releases the scents inside. Now I get a hot cup of tea and wonderful smells…heaven! 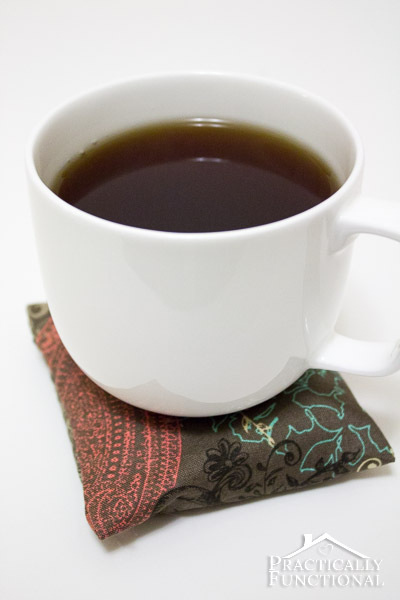 These simple scented hot pad coasters are the perfect gift for any coffee or tea lover in your life, including yourself! 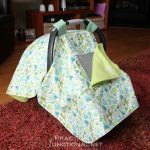 NOTE: The rice needs to sit for about 24 hours to absorb the scents properly before you put the hot pad together, so plan ahead when doing this project! The first step is to prepare the rice. Put about one cup of rice into a ziploc bag and add 6-7 drops of your favorite essential oil. Seal up the bag, shake the rice around so the oil is mixed in, and set the bag aside in a cool, dry place for 24 hours so the rice can soak up the scent. Once your rice is nice and scented, it’s time to make the coaster. 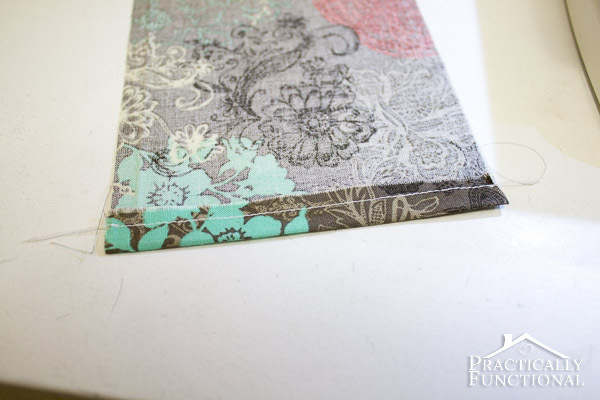 First you’re going to make an envelope style cover for the outside; it’s the same idea as the envelope pillow covers I made for our couch pillows. 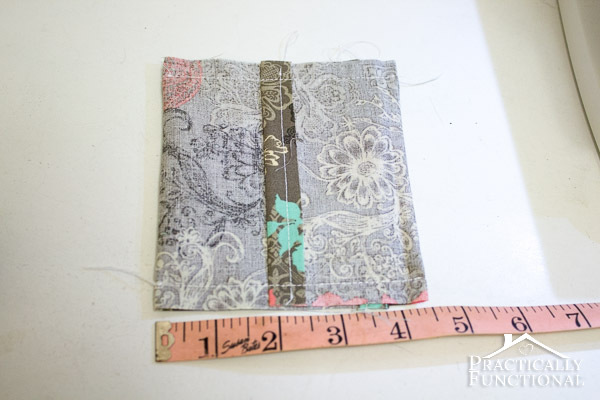 Fold over half an inch of fabric at one short end of the rectangle of outer fabric, and hem the end by sewing along the fold with about a 1/4″ seam allowance. Repeat on the other short end. Fold the long strip of fabric, right side in, so that both ends overlap each other about an inch or so. You want the final dimensions of the cover to be 4.5″ long, so adjust accordingly. 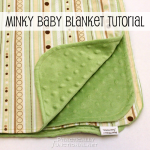 Sew along the open edges, leaving a 1/2″ seam allowance. Clip the corners and turn the envelope cover right side out. 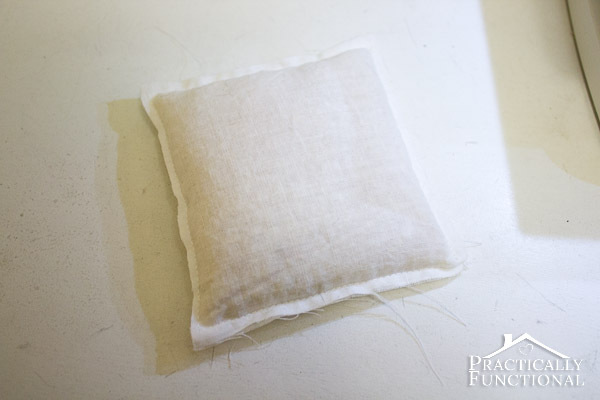 Then pin the two muslin squares on top of each other and sew around all four edges with a 1/4″ seam allowance, leaving a small hole on one edge to add the rice. 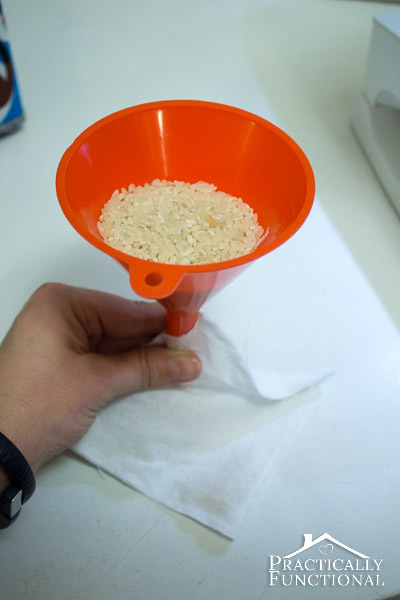 Use a funnel to pour the scented rice into the muslin pouch. The fuller the pouch, the more stable the coaster will be, so fill it as full as you can! Then sew the small opening closed. 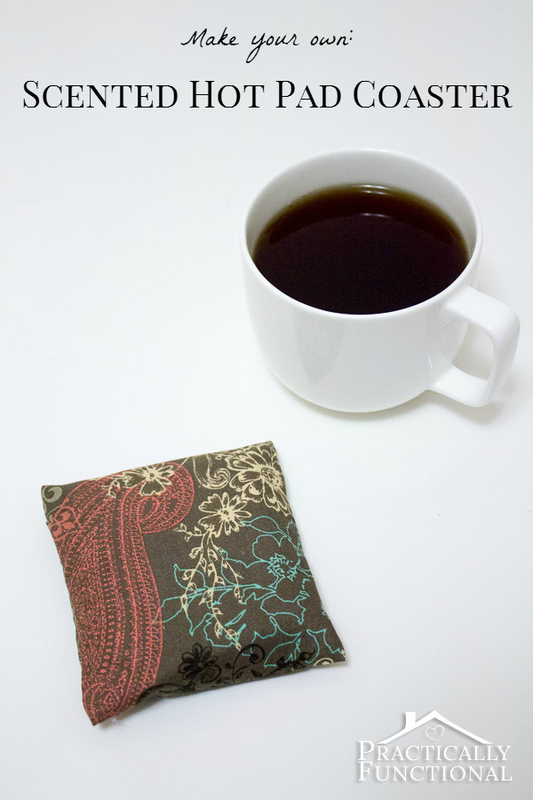 Put the small muslin pouch inside your envelope cover, and you have your very own scented hot pad coaster! Warm up a mug of tea or coffee and test it out! 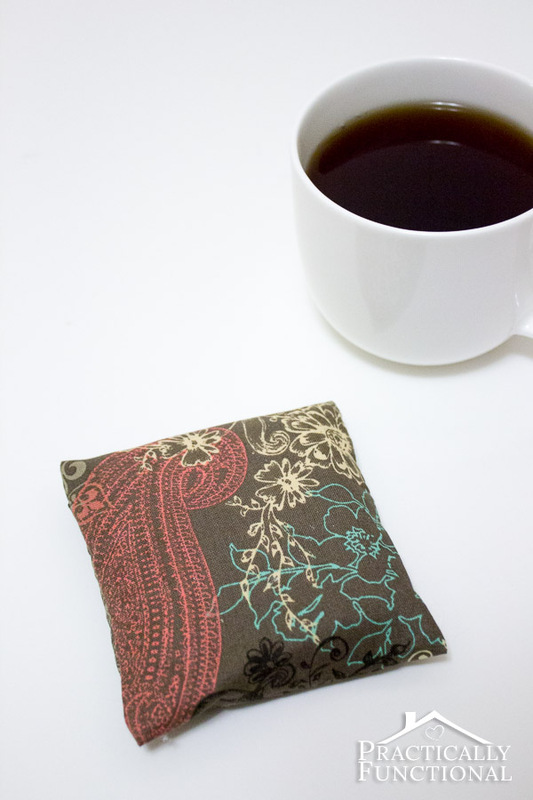 The reason I made this coaster in two pieces rather than just making a pouch of the pretty outer fabric is because it’s easily replaceable this way. If the rice loses its scent, just make a new inner muslin pouch with a new batch of rice, and you don’t have to get rid of the pretty cover! Or just use a seam ripper to pull open a corner of the muslin pouch and switch the rice out with freshly scented rice. You could also switch up scents if you want to! If you have three or four favorite scents (maybe one for each season?! ), make a muslin bag full of rice for each scent, and just switch them out into your favorite cover and you have a “new” hot pad each time! You should store your scented hot pad coaster in a plastic baggie when you’re not using it to keep the scent fresh and strong! So, coffee or tea, what’s your poison? I used Young Living’s lavender essential oil, which is probably my favorite of all the ones they make; it’s so versatile! It helps heal chapped, dry skin, minor burns, and itchy bug bites, and it’s great for helping you relax, so I knew it would be perfect in this coaster! I bet that smells amazing! Lavender is my favorite!!! I Love this Idea, I will be doing this with my mother – Maybe these will become my wedding favors? Oh I LOVE this! Going to a mom conference this weekend. We are doing a mug exchange and cant wait to make this as a bonus gift with the mug 🙂 Question… I am new to sewing and don’t have any muslin. Is there anything else I can use that will let the scent out as much? More cotton or batting even? Regular cotton will work just fine! Muslin is basically cotton, just ever so slightly thinner. But if you have quilting cotton or t-shirt cotton that will work fine. Good luck with it! what kind of rice did u use? does it matter what kind? Doesn’t matter what kind as long as it’s dry, uncooked rice. That way it can soak up the scent!